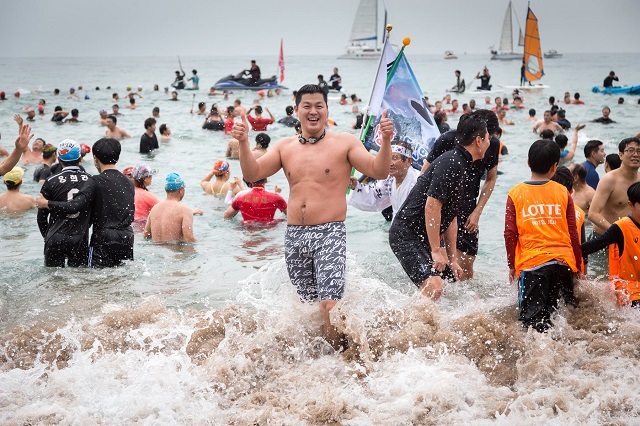 The 16th Seogwipo Winter Sea Penguin Swim was held on Jan 2 at Jungmun Saekdal Beach, Seogwipo City. Revelers came to take part in the annual tradition as participants enjoyed various fun events such as a turtle egg hunt and a flipper race. The main event was the swim itself as up scores of brave souls jumped into the winter seas with a few of the strongest swimmers grabbing a winning ball. The ball was later exchanged for a free stay at the KAL Hotel. After the festivities everyone hunkered down for a warm bowl of momguk pork soup and dombegogi boiled pork. All of the action was caught by photographer Eric Hevesy. You can see the full album here or visit his Facebook page here.